First, definitely join the Polish Pickup Facebook Group. You don't necessarily need to actively participate in the group, but it will give you a look into the polishes coming in the coming month. Polish Pickup themes are chosen by the people, often a few months in advance (brands need time to find their inspiration and test their polish). Any indie brand that has been around for at least a year can participate and each has their own specific inspiration picture and polish for that month. All you need to do is go to the Polish Pickup site during the pre-order window (the first Friday-Monday of the month) to make all of your purchases of these exclusive polishes. There's no need to pay for multiple shipping charges; since this is a pre-order, all polishes get sent to Polish Pickup and they send you the polishes you ordered. Yup, it's that simple. Oh, and shipping is a flat-rate of $3 to the US ($5 for Canada and more for international). Last month they also opened a UK site which you can find here. Since all orders are pre-orders, shipping will take place about 3 weeks after the end of the pre-order. Tonight I have the Noodles Nail Polish shade to share with you. Again, February's theme is Famous Duos, and Natalie was inspired by the Gilmore Girls. You're going to hate me, but I've never seen it. I know! It's actually on my list to watch on Netflix, so I am going to watch it. The PPU store opens at 11:00 AM ET on Feb. 1st, and will close promptly at 11:59 PM on the 4th. The gorgeous crelly Life's Short, Talk Fast will retail for $11 and there will be a cap of 125 bottles. Life's Short, Talk Fast is a dusty blue crelly base with various sizes of hexagonal metallic and holo aqua blue glitters and a tiny bit of fine white microflakes. If you've never tried one of Noodle's glitter crellies, you're really missing out. She's not in the running for The Indie Swatch's Best Glitter Crellies category for nothing (as well as 2 more categories). Make sure to go vote for your favorite brands of 2018 here and I hope that includes Noodles. 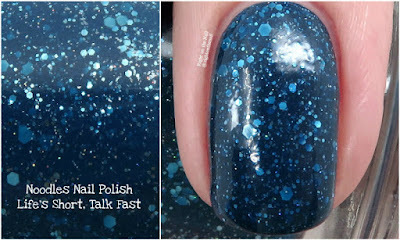 Life's Short, Talk Fast applied perfectly in just 2 coats and dried with a bit of texture from the glitter. I'd recommend a peel-off basecoat or the foil method for easier removal. Yet another stunner from Natalie! This one is exclusive to PPU, so get your hands ready for next Friday. The website isn't quite ready for wishlists, but it should be soon. You can find out more about Noodles Nail Polish on their website, Instagram page, Facebook page, and Facebook Fan Group while you can learn more about the PPU on their Facebook page and website. Have a great night!